Will Saudi Arabia's World Cup preparations pay off? Home GCC Countries Saudi Arabia Will Saudi Arabia’s World Cup preparations pay off? Will Saudi Arabia’s World Cup preparations pay off? Saudi Arabia’s video announcement of its final 2018 World Cup squad perhaps took inspiration from England’s, with fans excitedly sharing the 23 lucky names. On the pitch, the Green Falcons are looking to emulate their manager Juan Antonio Pizzi’s former charges, Chile, when they stormed to the 2016 Copa America title. So far, the results have been mixed. The hype and expectations that used to accompany the Saudi Arabian team to the World Cup has lessened somewhat with this being its first appearance since 2006. When it comes to pressure, Pizzi, wants his team to apply plenty to Russia, Uruguay and Egypt on the pitch in the coming Group A games. Since taking over in November — Saudi Arabia’s third coach in two months — the Argentine has been looking for more intensity, more running and more pressing. A West Asian version of the high-octane recipe he cooked up with Chile. It is still a work in progress but progress nonetheless has been made. May brought two comfortable friendly wins over Algeria and Greece and then, at the end of the month, there was a decent second-half performance in a 2-1 loss to Italy. Pizzi showed his tactical flexibility after a poor opening 45 minutes against the Azzurri, who were playing their first game under Roberto Mancini. The Italians had exposed Saudi Arabia’s lack of options in the striker department — the Green Falcons just don’t have a goalscorer they can count on. Mohannad Aseri was anonymous in the first half, as was his service. In the second, the target man came off. The team were playing without a No. 9 and looked more effective for it — mobile, speedy and fluid with the players, perhaps guilty of giving Italy too much respect early on, stepping up a gear. Yahya Al-Shehri pulled a goal back and Pizzi’s team finished the game strongly and with confidence. The Saudi media, almost as unforgiving as a football federation that has made 40 coaching changes since 1994, was more than satisfied. But then came Peru. The second of three friendlies, sandwiched between Italy and Germany, was not going to be easy but was an opportunity to pick up a morale-boosting result. It had been almost four years since Saudi Arabia had faced South American opposition and with Uruguay the second game in Group A, such a test was timely. It did not go well. The St. Gallen stadium was full of Peru fans with the Saudi supporters seriously outnumbered. The same situation manifested itself on the pitch with the men in red running and passing triangles around Pizzi’s men. The somewhat unfamiliar defence struggled to a 3-0 loss, though they had little to no protection from midfield. 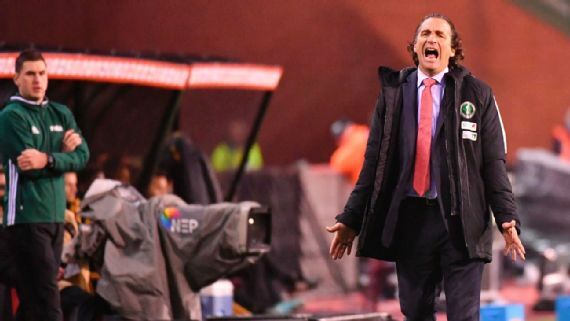 The fact that Pizzi took the opportunity to take a last look at some players who either did not make the final squad or will not make the starting XI against Russia on June 14 did not disguise a poor performance. Of the 23 who will board the plane to their St Petersburg base, only two are strikers. There are only three full-backs, though Yasser Al Shahrani can play both sides, and no less than 11 midfielders. There is no doubt where Saudi Arabia’s talent lies. Now that the squad has been settled, the focus is on Germany on Friday in Leverkusen. There are some concerns that playing the best team in the world a week before a first World Cup game for 12 years is a risky move — especially as the holders are coming off a painful 2-1 loss against neighbours Austria. Nelo Vingada led Saudi Arabia to the 1996 Asian Cup title and the well-travelled Portuguese coach would not have arranged such a test at such a time. “It will be hard especially as the memories in Saudi Arabia of games with Germany are not good,” Vingada told ESPN FC, referring to the infamous 8-0 loss at the 2002 World Cup. While the 65-year-old does not expect a repeat of that scoreline, he is still concerned. “A big defeat could have a big effect on morale,” Vingada said. “Sometimes you need to play against strong teams but not in the final game. All in all, it is a brave move. And bravery has been part of the plan since qualification with games against Belgium, Portugal, Italy and Germany all arranged. Saudi Arabia hope that, in terms of physical approach on the pitch and atmosphere off it, Germany will give them a taste of what to expect in Moscow on June 14 against Russia in the curtain raiser. Only time will tell if it is the right decision.